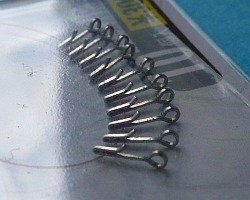 Micro fishing tippet connectors allow you to quickly and easily attach a snelled tanago hook to your main line. No knots or loop to loops are required. 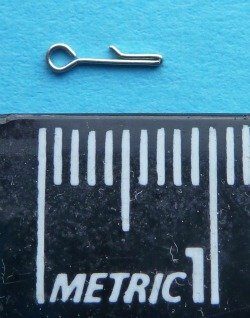 I learned about them from the Micro Fishing Kit because it uses one. It makes rigging or re-rigging much easier than messing around trying to tie a knot in a 1 lb test line (even if it is red so you can see it). It doesn't slip. I don't know if it significantly weakens the tippet, but the snelling on the tanago hooks is about 1 lb test to begin with, so great strength is not its primary attribute. Please note: the tippet connectors are specifically designed for use with snelled tanago hooks. 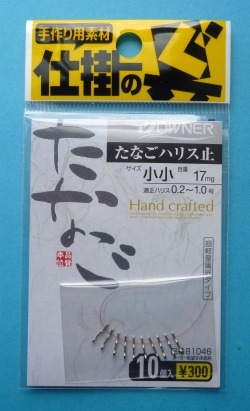 If you use them to connect regular tippet to a tenkara line, it will not hold. I suspect the material used in the snell of the tanago hooks is softer and not nearly so slick. Besides, as I have mentioned before, I think one should give the micros a fighting chance. If there is no possibility that anything you might hook could break your line, it takes a bit of the uncertainty and a lot of the heart-in-your-throat adrenaline out of the whole process.